A Rakhsh 4x4 APC can be seen in the very far right of this photo. 12.7 mm DShK 1938/46 heavy machine gun, 30 mm cannon or a twin 23 mm anti air cannon. 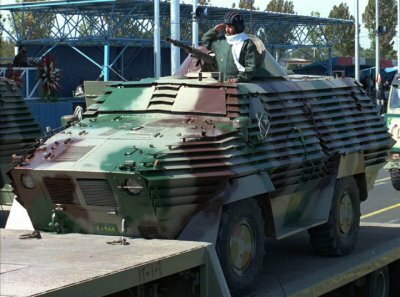 Rakhsh is a lightweight Iranian 4x4 cross-country APC developed and produced by DIO's Shahid Kolah Dooz Industrial Complex and named after Rakhsh, the mythical horse of Rostam in Shahnama. It is probably based on a proven 4 × 4 cross-country chassis present in Iran before and is in service of Iranian Police, Iranian Army, IRGC and Sudan. It was unveiled for export market, but also entered service in the Iranian police and military (particularly IRGC). It is believed that about 20 of them are exported to Sudan as a contract signed in 2004. Deliveries started from 2005 and ended in 2006.
artist's impression of the Rahksh APC. The hull is made of welded steel which can protect the occupants from 7.62 mm small arms. Driver's is in the frontal left part of the vehicle sided by the commander's. Both of these are protected by bulletproof glasses. In addition, 8 fully equipped troops can be carried by the rear compartment that also has small bulletproof windows and 10 associated firing ports that allows troops to fire their weapons from within the vehicle with some level of protection. The crew can rapidly enter and leave the vehicle via a door in either side of the hull and twin doors in the hull rear. It uses a DO 824LFL09 4-cylinder diesel engine with the output of 155 hp giving it a high speed of 80 km/hr on road and excellent off-road mobility. It comes in some different version. The most basic one has a 12.7 mm machine gun attached to the top of the hull with a rotatable mount similar to that of Boragh APC. Other versions are seen with ZU-23-2 23 mm anti air cannons or a 30 mm Autocannon similar to the ones used in Russian BMP-2. Standard equipment for the Rakhsh includes a central tyre inflation system that allows the driver to adjust the tyre pressure to suit the terrain being crossed, tyres fitted with run flats, differential locks and a powered winch. As it will be deployed in high ambient temperatures an air conditioning system is fitted as standard. As the Rakhsh has good cross-country mobility it can be used for a wide range of battlefield missions as well as a baseline APC. It could also be modified for use as an internal security vehicle. Also there are additional options for buyers such as banks of smoke grenade launchers, NBC system and additional ceramic armour. These are reported to increase the protection against 12.7 mm machine guns up to 14.5 mm. Iran - By Army, IRGC and Police. Sudan - Bought about 20 in 2004. Deliveries started in 2005 and ended in 2006. ^ a b c "Modlex product: MXF04-000060 Rakhsh - 4x4 Wheeled APC". Modlex.ir. Retrieved 2012-07-25. ^ a b "DIO Rakhsh armoured personnel carrier (Iran) - Jane's Armour and Artillery". Articles.janes.com. 2012-01-03. Retrieved 2012-07-25. ^ "Iran reveals Rakhsh APC - Jane's Defence Weekly". Articles.janes.com. 2006-11-24. Retrieved 2012-07-25. ^ "Trade Registers". Armstrade.sipri.org. Retrieved 2012-07-25. This page was last edited on 30 December 2018, at 07:30 (UTC).